I’ve done Disney World the easy way (off-season and short lines) and the hard way (during Spring Break when the park was at capacity), but this was the first time that I was invited by Disney as media to welcome Princess Tiana to Disney World. My first time doing Disney VIP-style. Let’s start with the people that I was so fortunate to be with during this fabulous experience. Taking us on this whirlwind journey was Laura Spencer, Social Media Manager for Disney World. She was our fearless (and hilarious) leader. I met Laura at Blogalicious ’09, but didn’t know just how wonderfully kooky she was until now. Laura ran a tight ship, but provided plenty of laughter along the way; she loves her job and it shows. Heather Murry and Darcie Maranich, both on the 2008 Disney World Moms Panel, were also on hand to share their wealth of Disney World knowledge. Besides myself, there were 7 other bloggers invited on this media trip: Lucinda Anderson Hughs, Deveter Brown, Angela Cooper, Onica Cupido, Lorraine Robertson, Tara Jefferson, and Lashanda Henry. Lorraine is the only person that I knew before the trip, but by the end, I had made new friends. We were the social media bunch; there was traditional media represented as well and we spent much of our time as one big group. The magic started upon entering Animal Kingdom Lodge. The decor is incredible, the art work authentic and the animals outside were so fun to look at (I love animals). African drummers can be found at numerous times of the day providing further ambience to the whole African safari-like experience. As excited as I was to be at Disney World, believe that I was working; we were gone from about 7:30 a.m. until 11:30 p.m. everyday and moving fast the entire time. Disney World made sure that we had many different wonderful and magical experiences (via the backstage secret VIP entrance! ), but the main reason we were there was for the debut of Princess Tiana, Disney’s newest and first African American princess and star of The Princess and the Frog. I remember a few years ago when I first heard that Disney was doing an animated movie with it’s first African American princess and I was so excited. Since that time I have heard all sorts of commentary about what she should look like, what her cultural background should be and how she should be portrayed. Poor Princess Tiana…as I have said before she has a heavy crown to carry on that pretty little head; being “the first” anything is hard. But from what I have seen, Disney has done a remarkable job with the movie The Princess and the Frog. Besides the movie, I’m excited that my daughter has Disney images that reflect her cultural heritage and I’m happy to say that Disney’s Bibbidi Bobbidi Boutique, a princess make-over salon located in Cinderella’s Castle, now has a Princess Tiana package. African Americans were intricately involved in all aspects of the movie, from the voices of Anika Noni Rose, Jennifer Lewis, Keith David, Terrence Howard and Oprah Winfrey to Supervising Animator Bruce Smith. Bruce has a long and impressive career trail as one of the few African American animators in the industry. Just to name a few highlights, he has worked as Supervising Animator on several Disney movies, directed the animation in Space Jam, directed Bebe’s Kids and he’s the creator of The Proud Family. My son loves The Proud Family and was pretty impressed when I told him that I met and hung out with Bruce at Disney World. The big day arrived and Princess Tiana made her debut in Magic Kingdom with a processional and official welcoming ceremony. TV stations and many other forms of media were there for this historic event. Besides the processional parade, we got to see the debut of Princess Tiana’s Showboat Jubilee, a 9 minute show aboard a riverboat on the Rivers of America in Magic Kingdom. I really enjoyed the show and grooved along to the music; I tell you, this movie is going to have an awesome soundtrack! As usual with all Disney movies, the songs are so catchy that you pick them up in no time. I left Magic Kingdom that day singing, “♫ Going down the bayou, going down the bayou, going down the bayou, taking you all way ♫“. After the media event for Princess Tiana’s official debut in Disney World, my media group had a special VIP experience in each Disney World theme park. Our first stop was Disney’s Hollywood Studios where after viewing the show, we took a behind-the-scenes tour of The American Idol Experience. Michael, our cast member guide, explained the whole audition process and showed us the Coke Lounge and producer offices. Our time at Magic Kingdom began in newly updated Hall of Presidents; Disney imagineer Diego Parras talked to us about the incredible work that goes into making the Disney magic. Disney has a patent on the audio-animatronic system and Hall of Presidents is a good place to see that magic in action; while the whole show was impressive, the figure and gestures of newly added President Obama was so very life-like. Diego confirmed that it was the most technologically advanced of all the presidents represented. Speaking about the whole imagineer experience, Diego explained how it is the mission of the Disney to create stories for guests to immerse themselves; therefore, imagineers have to immerse themselves as well. For example, while creating Expedition Everest they went to Nepal and while creating Mission to Space they worked with Nasa. Most of all, he said to be an imagineer you have to think outside the box and act like a kid. Sounds like a ideal job description to me! We were also in Magic Kingdom to enjoy Mickey’s Not-So-Scary-Halloween Party, a ticketed event independent of regular admission. Guests were dressed in costumes, trick-or-treating was available at various candy stops and Halloween decorations were everywhere. We took a quick ride on Pirates of the Caribbean and then enjoyed the highlights of the night: Happy HalloWishes Fireworks and Mickey’s Boo-to-You Halloween Parade, which we got to experience VIP-style on the top of the train station. Hot chocolate and dessert buffet selections in hand, we saw 2 awesome shows from the perfect vantage point. The parade starts with a run by a headless horseman – truly magical, but hard to catch on film. So, how about this for VIP treatment at Epcot: being whisked right off our private bus and ushered into fantastic seats at a Boyz II Men concert. Seats so good that it was an easy catch of the roses tossed our way. Boyz II Men looked and sounded great, but our interaction didn’t stop there at the concert; we met up with them later at a VIP dessert reception. Animal Kingdom wasn’t left out of our tour of Disney World; we had a private Kilimanjaro Safari aided by the commentary of cast member Ric. Before the safari we saw where many of the animals lived backstage and learned about the conservation efforts of Animal Kingdom such as how the safari trucks run on propane and cast members park their cars to ride bikes throughout the grounds. As we viewed the animals Ric was a wealth of knowledge and answered all of our questions; we were so fortunate to have his expertise at our disposal. I truly enjoyed doing Disney World VIP-style! Not only was I present for a historical Disney event with the debut of Princess Tiana, I had many other amazing Disney experiences and met some wonderful new friends as well. I must say, it’s going to be very hard to go back to being a normal park-goer after the experience I just had. As sad as I was to leave Disney World, I left on a very high note. Lorraine and I managed to squeeze in a ride on Expedition Everest right before we left for the airport (no VIP this time, but luckily there were no lines). It was her first time riding and as you will see, she loved it. And that’s how you say good-bye to Disney World, with screams of joy and lots of laughter! Woo-hoo! *Full Disclosure: I was invited to Disney World as “media” for the debut of Princess Tiana. My entire trip was paid for by Disney (hotel accommodations, flight, transfers and meals). P.S. 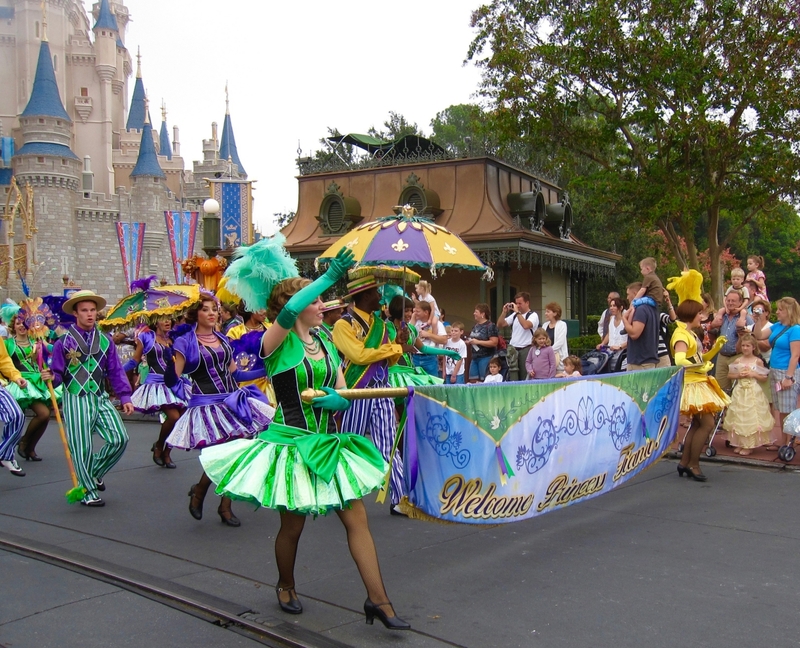 You may also like to read about other Disney World media trips. Wonderful, wonderful, reading. I loved the description and could picture each spot. Always knew you had the talent.. So glad you had this great this VIP treatment added to what I know will be many more… Great details, I felt as if I were there with you..
Wow! Twice this year you have delighted me with the adventures you have taken to Disney. And, for you to go from budget conscious family trip to VIP status is fantastic. I’ve been going to Disney world at least every 5 years since I was 5 years old. I’ve never had the VIP treatment but what you experienced seems like a 1 in a lifetime event. You are blessed! Now, I want to return and see the new addition! .-= TheJennTaFur aka 2Serenity´s last blog ..The Official Portrait of The First Family by Annie Leibovitz =-. This is absolutely fantastic! I know Jawn. A true sweetie! The chocolate treats and hot chocolate would have sent me over the edge! Wow! This post is fantastic and I can’t wait to take my kids to Disney in November! .-= ohamanda´s last blog ..Giving Up on a Perfect Halloween: 7 Bible Halloween Costumes =-. You DID get the VIP treatment! How fun that you were there for Tiana’s arrival. So glad you got to go! .-= Darcie – Such The Spot´s last blog ..Sick Fashion Sense. Cough Cough. =-. That was great! I had so much fun hanging with you ladies! Hope we can do it again! I laughed so hard I cried – again! What a wonderful trip … and post. .-= Wifey´s last blog ..Disney Magic =-. This looks like such a marvelous trip! I love Disney and how wonderfully they treat mom bloggers. So glad you and everyone else had a fab time! .-= Jennifer J´s last blog ..Always Made Me a Happy Woman Today =-.